OK! Here is your bank fishing contest, brought to you by Korkers and ifish.net! Don't forget to print off an ifish decal to carry with you! Wow, it is July! I already have tomatoes this year! I love this time of year! Fresh lettuce, strawberries, blueberries, carrots... yum! It's fun to make a dinner that is all made of your own harvested food. Last night, feeling tired and a bit chilled, I grabbed a blanket and followed Kilchis out to the river. I left my fly rod behind. As I strolled quietly along the river side, I took in many things that I don't see when I concentrate on fish. The blackberry bushes are full of unripe berries. It will be a good season! Soon there will be pies, and muffins and freezer shelves full! There is an odd weather phenomena that happens close to the river at times. It was chilly and windy up the bank. As I approached the water however, a very warm thermal wave hit me. What is that? It's so odd! I threw off my blanket, sat on a rock and enjoyed the warmth. It's truly like a heat wave! I'd love an explanation, if someone has one! It's a water heater? Birds filled the trees above me, and I tried to mimic their call. Kilchis dashed from bank to bank, chasing dippers and bugs. Will he ever slow down? I feel so much at home, here. So relaxed. Unlike crowds of people, or city life, the creatures that live on the river always seem to offer a friendly welcome. Never once have I felt out of place, surrounded by the native habitants of the river! The songs of birds, the music of water rushing over moss covered rock, the tiny splash of joyous smolts jumping, just because they can! As I sat, I was jolted out of wonder by Molly the cat, who jumped on my shoulders. She purred loudly, and rubbed her head against my neck. Molly loves the river. She jumps from rock to rock, over rushing water without a thought. Cats don't do that. Molly does! She slaps at the splashes and absolutely freaks out when I have a fish on. After I settled down, I scratched her softly, and rose to a stand. She stayed with me. Slightly bent over, Molly and I began a slow and somewhat hobbled trek back to the house. The sun was setting as we made our way through a thickly forested, shady tunnel that led to our lawn. I was delighted to be met with tiny dancing yellow flowers, everywhere! They were starkly standing out, against the deep green foliage. Weeds, huh? Misplaced flowers, I say! How many times I have passed these by! I bent over to take a closer look, and Molly jumped off her ride. I was well satisfied. I stood, and gulped in the fresh country air, and thought how lucky... How lucky I really am! I struggled with invading thoughts of my trip to Las Vegas. I have two weeks. That can wait! I needed to cherish the now. The fresh. The pure. The Kilchis river canyon, in July. I hope you have a wonderful time with your family, today! I have never seen Tillamook so full of people and boats! Man! I'd prefer not to go out in this mess until the Holiday is over, but I have to drive the kids to Astoria, tomorrow! On the Fourth! I waited at a stop light in downtown Tillamook for 10 minutes, before it was my turn to go through the green light. Andrew needed some toiletry items, and I turned into Fred Meyers. Not a chance! That place was so busy that I just drove on through, and went on to a small store that wasn't on the tourist trail. Taking a left, crossing hi way 101 off of the road that leads to town, is a nightmare and an accident waiting to happen. After waiting my turn until I was blue in the face, I finally took a right, instead! I turned around down the road, and finally was on my way. At the store, I bought enough of everything to make certain I did not have to return for days! I'm quite happy here, on the Kilchis river. No fireworks celebration for this gal! I'm sticking to my river for the duration! Happy Fourth to all of you, out there! All six billion! "When the salmon berries ripen." and... "The fourth of July." These are all things I have been told as to when sea run cutthroat fishing comes on, upstream. It was all of these things, last night. I wait for this day, with anticipation. As I parted the heavy brush to the trail, clumps of salmon berries hung like ornaments from their stems. Tiny green tree frogs jumped at my feet as I waded through the tall grasses. I headed for the water. It was, indeed, time for some fireworks! The sun was falling, and the decision whether to get in the car to go join masses of people to watch the Rockaway fireworks weighed heavily on me. I grabbed a wading stick. Step by step through the strong and shallow current, the decision was made for me. I was going fishing, it seemed, and my fireworks were to be made on the Kilchis river! 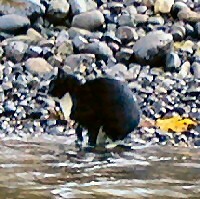 As I reached the area I wanted to fish, Kilchis loudly warned me of the presence of an otter's head, just slightly out of the water. I half allotted attention to the task of tying an elk hair caddis onto my tippet, and half eyed the otter. As my fly fluttered in the wind before it's first cast, half of me thought, "Otter? There will be no fish!" The other half laughed at the thought, "Otter on!" Can you imagine hooking an otter with a 2 pound tippet? Whooo hooo! I cast to the opposite of where we sighted the little guy. The calm water broke in an explosion that any fireworks seeking family would be envious of! This was no small fish! He pulled and he tugged, and then my line went limp! As I handed my line in, my fly was gone! My knot was, like I said, "half tied" by error of otter, obviously! I searched through my dry fly box. No more elk hair caddis! I tied on a Borden's Special and went on to fishing deeper in the hole. The day's last light was growing dimmer. It added to my anticipation. The show was about to start. I began the countdown, as I doubled hauled to the end of the riffle, and let my fly settle and swirl in the depths. Five, four, threeeeee.... Oh! sprinkles of sparklers! Fish on! I hand lined a small cutt, maybe 9 inches long, and released him with ease. I repeated the cast. As soon as my fly hit water, it jerked again! It was indeed, time! The show had started! The water erupted with fireworks like you have never seen and the music began to play! What so proudly we hailed at the twilight's last gleaming?" The drum rolls rolled, and the horns took up their stance. Fish after fish after fish I hooked, played, and released! It was a dream come true, and a Independence dance and celebration beyond my wildest dreams! Rockaway beach! You suffer in comparison to the river's wild call and the onward march of the clarki clarki! Kilchis ran madly, barking at otters and birds, and my rod tip was constantly at bend! The music changed as my mind wandered and the battle ensued. My posture straightened in pride, as cast after cast produced a wild display of cart wheeling cutts and displaced water! His truth is marching on!" Glory! Glory! Oh, Glory Hallelujah! I have another fish on! The light of day was fast leaving me, and my shadow had all but disappeared. Oh, Lord! I am transfigured! I must have hooked and released twenty or more small cutts. I caught nothing of any size. They were all 12 inches or less. As I made my way into the house, I excitedly told Bill of my patriotic adventure. In addition, there was still time to make it to Rockaway! We bundled up, and got in the car. As we approached the hi way, we noted the busy traffic. Car after car after car, lined up and headed for the beach! I shook my head. "No, Bill. Let's go home and watch it on TV." Anything they could offer, would pale in comparison to my fireworks on the river. We went home and flipped on the TV. As the music began, and the fireworks of Vancouver started, sixty thousand people screamed with excitement. Why? Were they catching cutts, too? I couldn't help but feel a little elevated, and just a bit sorry for them. If only those sixty thousand folks who had waited all day in the hot sun, could have experienced the fireworks that I had experienced, alone, with no crowds, and no traffic snarls. And God bless the Kilchis River! It is so still outside. Low, moist clouds are hanging quietly over the hills, kissing the top of the highest trees. There is no wind. There are no birds. It's just oddly hushed, out of doors. The low clouds only emphasize the stillness. I feel like I don't dare speak. I half expect the water to have no riffles, nor flow. As I gaze out of the window, it's much like a painting. Suddenly, one female hummingbird comes to feed at the feeder, and it brings the portrait to life. I was watching 60 minutes the other day, where an artist made prints of his artwork. After the prints were finished, he'd add hand painted highlights to the print, to bring it to life. This is what the hummingbird just did. After my Fourth of July fishing adventure, Bill and I snuck down to tidewater, to check out what was happening in the cutthroat world, there. The morning sun was bright. The water, so clear, you could see 15 feet down. I found it difficult to fish. I was too busy staring over the side of the small duck boat. I was watching small fry swimming in schools, near the bottom. The structures were amazing. Huge car sized boulders of mud had slid off their banks in heavy tides, and lay quietly in their grave. Perfect hiding places for larger cutts. And hide, they did! With the sun so bright, and the water so clear, the cutts were nervously shooting from one side to the other, in the deeper holes. Just by their activity, we knew that fishing would not be good. We could barely catch glimpses of them, let alone catch them by hook. I did see a wonderfully large summer steelhead, finning at the bottom, next to a large chunk of mud. He thought he was well hidden! I was breathless at the sight, and nearly could not speak to let Bill know he was there! The thought of hooking him kept me fishing. Can you imagine what these fish might think? Here it is a bright, sunlit day. There is no food to be seen, here, for miles. All of the sudden, from underneath their hidy place, comes a large wooly bugger floating by, just waiting to be eaten! "Glory Be! It's my day!" They must think! They dart out, barely seen, and gulp down the fly! OOPS! Somehow, most of them knew better! We did manage to fool a few, but not many. Top size was 14 inches. Still, it was a pleasant trip down the river. No boats were in sight. In fact, we didn't see a soul, the whole trip. We did see a bald eagle, a green heron, and a muskrat, swimming two feet from our boat! I also felt the wind in my hair, and the sun on my shoulders. Gazing over the side of the Kilchis river bridge into the sun sparkled river below, I searched for signs of fish. Any fish, be it a lost springer, or a cutthroat trout. A neighboring farmer pulled up with his tractor. After exchanging pleasantries, I was overcome with the most rancid smell on earth. Tillamook! His tractor was pulling a freshly gathered gob of Tillamook cow excrement, to fertilize a nearby field. It dripped from all sides of the trailer, and was slopped high with single strands of straw intertwined. I gasped for air as it hit me, and held my nose. "Smells like money to me!" He said it like he'd said it a million times before. I'm sure he had! I shook my head and laughed, as he drove his tractor across the bridge. He nearly caught my toes with the huge rubber tires as it bounced across the makeshift bridge. I couldn't squeeze up close enough, before falling over, to get away from that stench. Thankful for no more "dairy" air, I returned home. Kilchis begged for a trip to the river. Together, we headed for the beach. I, with peaceful rest on my mind. Kilchis, with totally different objectives. As I sat on a warm rock, my mind wandered with the summer breeze, to another time. I picked up one crumpled and dried leaf, and instantly thought, "FALL!" Gazing around me, I could almost see it! Higher water levels! Trees without leaves! Winds, swirling, cold in the muted morning light... and salmon! Salmon in the river, salmon on the banks, salmon, in different stages of their lives, surrounding me! On the banks, in the river, in the bay, and the ocean, all marching towards my home! My fingers played in the sand, as I dreamt. What is this? In the sand, I uncovered an old dried jaw of a salmon! With teeth, still! I held it in my hand, as my mind left me, again. Floods in the Fall cover the very place where I sat! Salmon, caught between tree limbs that float down river, are collected, right here! Dead, decaying salmon bodies, everywhere! And the smell! There are times when the smell is so strong that you have to dart from rock to rock, to avoid the very strongest smelling spots! "That Stinks!" I can hear my fishless visitors say. "Smells like Fall, to me." I laugh, as I practice the comeback. It won't be long, you know. It won't be long until the river rises, and the smolts are ushered to the sea. In return, giant mammoth salmon will start their migration up river to meet their destiny. After spawning, they will slowly lose their magnificent muscle, and float helplessly and hopelessly, to the shore. So many times I recall standing hip deep in the Kilchis, salmon swimming with their last burst of strength, as their sides touch my waders. How many salmon of days gone by, make up the very land that surrounds me? I recall long walks through their graveyards, calling them by name, "Silver!" or "Chinook!" or "Chum!" I really love that time of year! I shook the sand out of my sandals, and headed back to the house. Back to reality, where the Calendulas are just beginning to bloom. Past my garden, where the strawberries are waiting to be picked and made into shortcake. It's still summer. The blackberries have yet to ripen. It's so wonderful, though, to have something so miraculous to look forward to, each year. And every year, as the first leaf falls from the tree, I hold my breath, in anticipation. I can relate to how my neighbor feels, when he hauls that nasty stuff to the fields, and once again, I smiled. There is much more to it, than what meets the nose. The ifish "Old Salty" planers are in! You should order yours now, by clicking here! Quick! Before they are sold out! The link will be available on the top of the main ifish page, on the right. They are designed for the diehard "get it down deep" fishermen and women! Well, it's "Viva Las Vegas" for the boys and I, whether I like it, or not! I've been fighting some kind of stomach flu, which the folks at the hospital kept thinking was gallbladder, or ulcers, or something. They are still not certain, and my stomach still flops. I slept for the first night in ages, last night, all night long! What a relief! I'll have a laptop in Vegas, and will try my hardest to keep up with things. However, it's a sort of mini vacation for my kids, along with work. I want some "quality time!" We'll be going to the water park, there, and having a grand old time! First stop? A grocery store to buy a whole flat of cartons of Naked Orange Juice. I'll never forget our first trip, when we discovered the liquid gold. It tastes so wonderful! Then, on our second trip, Andrew and I raced to our motel room, stashed our luggage, and ran, in search of Naked! When we finally found it at Starbucks in New York, New York, we held hands and skipped through the hotel, singing, "We got Naked!" Now, that was a sight to see! We were just so darn happy! To heck with gambling! To heck with souvenirs! I want to get Naked! I have also saved up my pennies for a massage and half day spa. I can't wait! Now, that is not for quality family time, that is for MOM! I need some TLC! I thought I'd leave you with a little Dr. Seuss - like poem that I wrote on the board, in case you don't read that. :) Bye! Walking through the yard in the early morning, the cool ocean air feels good on my bare legs. I am wearing a pair of cut off wading boots and nightgown, cup of coffee in hand. Back to Oregon... where my heart is! Home to my river, and my critters, and my fishes! Las Vegas is still full of people. Gals with their hair up, scantily clad, trying to beat the heat. Families, searching for the best way to get from point A to point B. Desperate looking souls, handing out adult advertising material on the busy streets. Yuck! You know, it doesn't look far from one hotel to the other, in the desert. It's flat! Yet if you begin to walk, it's soon apparent that things are much further apart then they seem. Especially in 109 degree temperatures! Tired of paying a twenty spot for a taxi, (again and again!) we were convinced the local trolley car might be a good option to get Andrew, David and I, to the other end of town. For $1.75 cents each, we gave it a shot. What a social experience! A young African American gal greeted us with gusto, and welcomed us to a crowd of forty people or so. Some were over "lapped" and crowded on the few seats available. The other 30 or so were in the aisle, arms up, clinging to the hand rail. Everyone took a step back accommodate us. As the little trolley car burst forward into traffic, the gal yelled out, "O.K., y'all! We be bumpin' on the speed bump! Lift your bottoms, if ya's sittin'! Hold on and leanin', if ya's standin'!" The bus tilted and bumped, and landed with a nasty crash. The crowd in the back moaned as they came down hard. "I tooold ya's to lift um!" The rest of the nearly two hour journey was equally entertaining. Her voice rang out warnings at each turn and bump, as the crowd laughed. "We be turnin' left! Lean to the right!" "We be speed bumpin! We be bumpin' and leanin', leanin' and bumpin!" Even as the sweat poured from our pores and our arms ached as our bodies swayed with the buses erratic movements, the crowd was entertained. Her tip jar filled as the people departed on their way. I think this gal has learned how to operate in Vegas! We finally approached our destination. After dinner, we hailed a taxi. The return trip took us 15 minutes, but wasn't nearly as fun! We didn't bumpin' and leanin' once! The kids and I had a great time. We came home early, however. The first time we went to Vegas, we had a great time seeing the sights. The second trip, we managed to take in things we had missed. This trip? I think we had seen most of what we wanted to see, and our days were a bit longer than we wished. I have carrots in the garden that are now actually big enough to eat! It's amazing, at this point in the summer how rapid things grow! Four days gone, and my garden looks like a real garden! I have more lettuce than I can imagine eating! Real squash on the vine! Blueberries, strawberries and raspberries, divine! I have much to do. I need to add Eric Linde to the ifish team of Washington guides. I have to catch up on the board. KOA needs a phone call to finalize ifishstock plans. I need to check with Buzz to see if he will be attending, to do a dutch auction. I secured a bluegrass band for after raffles! So many, many things on my to do list, which is growing nearly as fast as my garden! Last night, I got home at midnight. Andrew came rushing out of his bedroom, in a panic. "Phoebe is gone!" Phoebe is his little sugar glider. A nocturnal pet, that flies, and hides in impossible to find places, when she gets loose. Adding more to the disaster, was the fact that his window was left open, and the cats were loose. Nothing more tantalizing to the cats, then this squirrel like creature. Bill felt awful, as he had worked hard to feed her in our absence, and had accidentally left her cage door latch loose. Andrew was crushed, thinking of the possibilities. It wasn't long before David shouted, "Phoebe is in my room!" We secured the area, and began the capture process. Phoebe finally in her caged quarters, the house shortly fell silent. We began a restorative, and peaceful night's sleep in our naturally air conditioned coastal home. With the window's thrown open, I dozed off as the river played it's quiet summer song. Peace and quiet, rather than the bright neon lights and blaring sirens of the hot city on a July summer's night. Oh dear! I caught Bill having dinner with some chick! Click here to see the proof! I set up a secret cam, and caught him, red handed! You know, I'm hooked on Hazelnut creamer. When I'm away from home, I go through withdrawals. I enjoy black coffee, but it takes a while to get used to it without my sugary companion. When I get back home, it pleases me to no end to pour some of that wonderful liquid into my coffee! Welcome me home, hazelnut! I didn't make coffee last night, and so I didn't set the auto timer to brew. There are two things to consider, when I forget. I'm tired in the morning, sitting here waiting for it to brew. On the other hand, I will be drinking fresh coffee in just a few minutes, and I will get to pour Hazelnut creamer in my fresh coffee, soon! Why am I writing about this? Because I haven't had coffee, yet! I added some wonderful fishing trip pictures to Mark Charlton's page, sent in by David King. Click here, and then scroll down to "Fishing 2004." Er... You might want to give him a call, if you've yet to catch many fish, this summer. He is hauling them in! I love fishing with Mark! I've joined him, several times, and he is one heck of a fish catching professional! Yesterday while randomly reading a thread, someone posted that I had sent them three ifish hats, when they had ordered only one. Oh no! This means that I mixed up a couple packages for delivery. I'll bet anything that someone that ordered three, only got one. Please, if you are that person, let me know! The other day, Bill noticed a juvenile male evening grosbeak, hopping in the bushes. It seemed not able to fly, and held it's wing lopsided. I didn't think much of it, at the time. Later in the day, I noticed the cats chasing it. This will NOT do. So, I caught the baby, put him in a cage, and gave him water and food. He drank and ate with gusto, and did not seem afraid. I worry about small birds with broken wings, as their bones calcify quickly if not set to heal properly. I called the vet. Sure enough, a wildlife place in Lincoln City would come pick it up, if I drove it in to town. Drive it in, I did. I feel good about that. Somehow driving into town to do banking or shopping is a chore. This was not. This was pure pleasure. If it heals, the wildlife folks will bring it back here, to release. I wish they could band it. It would be fun to watch for its return, next year. I fished last night, right up until dark. Molly the cat leapt from rock to rock over the shallow riffles, to get out as close to me as she could to me. More than once, she has slipped and fallen in. Yet, this does not stop her. She cries pitifully if I cross the river, and she cannot follow. It really makes me nervous that she may attempt crossing. Yes, with this cat, it's a real possibility! Kilchis the dog ran from one side of the river to the other. Behind me, in front of me, over here, over there! I watch with envy, and think how much water I could cover if I had that much energy! It amazes me that even with his incessant barking at dippers and joyful splashing of water, I still catch fish! Catch fish, I did. Nine, ten, and finally a 12 inch cutthroat trout. They are getting bigger as the blackberries ripen and the summer closes in on us. As I carefully crossed the river, I held my fly rod in my hand. I packed my small spinning rod, also. It stuck out of my back pocket and hovered over my head, weaving back and fourth as I slipped on the rocks. I keep thinking I'll use my spinning rod. That, somehow, the "Super Duper" Luhr Jensen lure will outfish my fly. I took two casts with it. Nothing. Back to my fly. I think I've finally learned that when trout fishing, nothing outfishes a spruce fly on the Kilchis. Except, maybe bait. Remember folks, you can't use bait on the upper Kilchis right now, and you must release all cutts unharmed! As the evening light approached, the trees surrounding me came alive with birds, tucking themselves in for a long summer eve's nap. Everything was still and windless as I trekked back across the river. I called to Kilchis to come beside me so that I could lean on him and steady my gait. He's a handy companion, and keeps me from falling. Back at the house, I locked the chickens in, and then noticed the four eggs I had yet to retrieve. How to get past the nasty roosters to those beautiful eggs? I have taught Kilchis well. I point to the nastiest of roosters and say, "Bad chicken!" Kilchis doesn't hurt Ralph the rooster, but he does know how to back him off. He jumps at him, and barks. Kilchis knows which chicken is bad, and which is good. He leaves the hens alone, and goes for Ralph. Ralph normally backs off. "Good Kilchis!" However, last night Kilchis did not want to play "bad chicken." I was forced to leave the cage. I was in shorts, and was in no mood to get my bare legs scarred by the big bad chicken! Oh! I just heard the last sigh of the coffee maker, and I should go get those eggs, too! I think I'll put on my hip boots to get them, rather then rely on Kilchis, today! Have a wonderful weekend-- Hazelnut, here I come! Last night, I watched the river otters play at dusk. Kilchis had joined the otters for a swim, and it was quite a show! I don't know that either were afraid. Both, just curiously swimming in the water, together, wondering what each other were. Kilchis barked, but his tail was wagging. The otters bobbed their heads out of the water, swam towards him, then backed off. After the show, I returned to water my garden. I have been filled with wonder, lately. Wonder at the beauty of each season of the river, and the different stages of life it holds. Wonder at the different stages my garden goes through. Wonder, as the blackberries on the bank burst into deep black color, the branches, heavy with fruit. Each stage of life has a feel to it. I have watched the development of life so many seasons, now, that I feel closely in tune to what is coming, next. I think back to talking with Jim Erickson, one Fall. We were fishing on the South Fork of the Nehalem for the returning chinook, headed upriver. He was downcast, and told me how Loretta and he felt sad this time of year. How death became so apparent to him, in the Fall. His garden failing, his lawn turning brown, the beautiful swaying green leaves of trees, turning crisp, and floating to the ground, leaving bare limbs exposed. I can relate to that feeling, if I stop to listen and look. However, I'm always looking forward to Fall, because that is when the river around me is breathing it's first breath of life. In my world, all summer long, the Kilchis river runs as quiet as death. The gleaming white, crust covered rocks crunch under my feet. Shallow back eddies are filled with slurry moss, and do not sustain much life. But, the Fall! The Fall is when the river levels rise, and brings fresh, new life to my back door! The rocks are scrubbed clean by the force of the current, and mighty salmon swim upstream, and fill the water with life! Soon, schools of chum are visible in the pools. I watch the changes from the same spot I watched the otters play, sitting on the grasses above the ever building water line! Jim lives on a river. He understands this, deep down, I'm sure. It's easy to get lost in what appears in front of your eyes. Just look deeper, Jim! The fish are at your feet! ALIVE! As I held the hose, and saturated the ground around my squash plants, I noted that there was much bare ground, surrounding them. Later, the enclose space will be so full of foliage and hidden fruit, that I won't be able to navigate without the stickly feel of their leaves against my bare legs, as I search for dinner. The dry and parched earth swallowed every ounce of water that I offered, as I was lost in thought. I don't know how city people relate to life and death, not living where it happens in front of your eyes, year round. I think I would be filled with confusion, living so far from experiencing the changes of season, without watching life miraculously appear from planted seed, be born, grow and die, or without watching a river rise and fall, burst with life, and wither, with the seasons. Watch closely the changes of season, the trees, the rivers, and the life that is constantly in change. With it, you will grow anticipation, excitement, and not least, a calm and peaceful familiarity. I feel familiar with the amazing wonder of birth, growth and death. It is comfortable to me, and I am not afraid. Without the usual "ex" bitterness, I call the kid's Dad a "Disneyland Dad." He's good to the boys. I was out fly fishing at dusk, when the familiar big red Ford diesel truck came to deliver them home. I met them in the kitchen. They came bounding in from their usual every other week overnighter with him. David excitedly reported, "We went on the Rogue Jet Boats and Andrew drove there, and I drove back!" The kids are growing up and up! Not only in height, but they have driving permits! Wow! I listened to their tales, as they towered over their "little" five foot eleven Mother. They sounded like they had a wonderful trip. Yesterday, I couldn't help but notice spider webs hanging on the trampoline, as I passed it. Bill has placed a single rock in the middle, to note if it ever gets used. I am privately thinking he wants to get rid of it, if it's not used. I can't handle that thought. The trampoline, although a ghost of my kid's youth, must stay! It's sad to see it go unused, but I don't think I could handle seeing an empty space, where it lived. --Quite yet, anyhow. There will come a day, I suppose, but I'm not ready to face that, yet. They are on to bigger, more grown up and worldly things, now. I miss the days we'd lay together on the trampoline, exhausted after bouncing and laughing, to search up in the sky for eagles, or cloud formations. I miss the days they'd jump high to see over the blackberry bushes, and report a deer on the river. I miss eating dinner on the tramp, and I miss seeing it covered with blankets in the morning, after David and Andrew slept under the stars, using their friendly trampoline as a mattress. I doubt I'll ever sell it. I'll just move it somewhere where it is easier to mow under. Someday, when they return from college on a Holiday weekend, I will lead them both out to the tramp... and we will jump, again. For not wetting a line, I have never had so much fish! Pilar came over on Sunday and delivered mass quantities of TUNA! I have never had fresh tuna, but oh boy, now I have! I have had Tuna seviche, I have had fried tuna and toast in the morning, and I have had grilled tuna at night! Yesterday, I went over to Loretta and Jim's house, on the Nehalem river. We had a tuna canning and fish packing party. Now, I have 30 pints of canned tuna! While we waited for the tuna to process and cool, we headed out to the garage to target practice. It was so fun, and you know what? I'm pretty darn good with a .22! Jim has a shooting range set up, where you sit in the garage, shells in a box at your side, and shoot out onto a really cool target. There are five metal targets that hang loose, on a cross bar. When you hit one, it flips up. When you hit all five, you have to hit one on the top, and it re flips them all, down. I've GOT to get one! I had no clue shooting is so much fun, nor that I was actually any good at it! Both Jim and Bill were really impressed! So was I!!! Last night, I had snapper and ling cod fish and chips, for dinner. It was the best fish I'd ever had! Now, off to look in Cabelas catalogue for those target thingies. I wonder if they have them? I'm off to fish the Nehalem! I have something new to try that has me all pumped up! I got it at ICAST. I'll report later! Even at the beach, it's sizzling. The Nehalem river fishing trip I went on proved to be an exercise in lazy summer trolling. No action. The salmon must be too hot to chase anything. They just hover on the bottom, as we mark them. "There's another fish." Bill yawns, as he points to the finder. I think they were to busy applying sunscreen to notice our fresh herring and flashers. In the afternoon, Kilchis and I went down to the Kilchis river. I couldn't settle on a resting place. It seems that the river has stopped running. Instead, it settles in sloggy, moss filled pools where water skippers skate across the surface. Even the fry and smolt were too warm to break surface as they usually do. It was still, and hot, and uncomfortable. I moved from sun, to shade, to shadier, and never did find relief! The air was solid and still and stifling. So, after dinner, Kilchis and I hopped in the car, and headed for the "beachy." Surely I'll find relief, there! Kilchis goes nuts at the word "beachy!" As my bare feet hit sand, it was apparent that we were not going to escape the heat at the beach, either. The ocean air, although moving, was humid and warm. People crowded the ordinarily lonely coast line. Kilchis hit the sand at 90! He was off! How, possibly, can a dog with thick fur, still feel so much energy in these temperatures? Maybe I ought to take up chasing seagulls. Kilchis raced to the ocean's edge, and then just kept on going! Wave after wave hit him in the chest until the seagulls were well past his safety zone. Water flew everywhere! Dogs that had settled in with their companions, seemed to catch Kilchis's energy, and joined in the fun. Kilchis met a german shepherd and an Australian Shepard, and they instantly became the best of ocean buddies. I was thrown into conversation with their owners. There is no better way to meet people, than to bring your dog to the beach! I had pleasant conversations, and laughed along with them, as we watched our children at play. After a while, Kilchis and I decided to call it a night, and headed back to the truck. Thirsty, we drove over to Lake Lytle to get Kilchis a drink. More dog friends! More dog owners to chat with! It seems the whole of Tillamook had headed for water on this unusually warm, summer day. On the way home, Kilchis hung his head out the window for a bit, before snuggling down to rest on the drive home. I received a funny note in my e mail. Why is it that when you blow in a dog's face he gets mad, yet the minute you get in the car, he sticks his head out the window? Huh? Upon arrival at the house, Kilchis wandered around in the heat for a bit, then headed for the door. It was as if he said, "Mom, it's hot here. River?" Down to the river we went. It was still hot, even as the sun set and the light grew dim. Kilchis took up chasing dippers, as they tried to settle for the night. Kilchis... he just keeps going, and going, and going. How I wish I had that kind of energy! It's 8:00 in the morning, and sixty degrees. I wonder if we'll get fogged in and cooler, today. By the looks of the bright blue sky, I'd say not. However, I think I'll head for the river to pick some more blackberries for a pie, now that it's still cool out. Think Kilchis would like to join me? Click here for "My Blackberry Pie"
Yesterday was "shuttle the kids" here and there, day. First to band practice, then David, to his friends. Then, David up the river, with friends to float back home. They floated it at 8:00 at night! Kids! It was fun, then, to gather at the house, and serve them all pie. With a little Breyers vanilla bean ice cream on top, it was the perfect close to a hot day! Hey, wonder if it's good for breakfast, too? This morning is cool and a little foggy. It's so refreshing. I feel good, today! I woke up with the unusual desire to go for a walk. Yesterday was so hot at the coast! I think our record was 96.3 on the Kilchis Weather Station. I have been battling with ad ware. I can't believe how many programs you need, these days, to keep your computer running efficiently. I have, Super Cleaner, Ad Aware, Norton anti virus and anti spyware, Spybot, and The Ultimate Troubleshooter. Sheesh! I spend a half hour a day, just running cleaning programs! I wonder if someday it might not even be worth it. Bill, who dislikes computers in the first place would never go for this! It's so cool and crisp out, that I really do want to go for a walk. I think I'll bring my fly rod along. If I feel this good, the fish have GOT to be biting! I have three dogs. Two that bark, one that "meows." 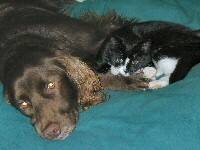 My supposedly feline friend 'Molly the cat' may actually be a dog. She came from a litter of kittens. I witnessed this. So, you can imagine my total surprise. Last winter, I launched the drift boat out back, rowed over to the other side, and anchored to salmon fish. Molly sat at the river's edge, and moaned and howled, pitifully. I had left Kilchis (a real dog) in the house, to avoid this very thing. Although annoying, I thought everything would be fine. I was wrong. While watching her with one eye, Molly began to wade in the winter's turbid winter flow. "MOLLY, NO!" Cats can't swim! Nor, do they like to! She was determined, and I was in a panic. I knew what Molly did not. She could not fight this current despite her will! I quickly lifted anchor and rowed to shore with the intent of taking her to the house. 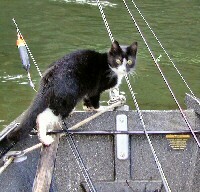 I was discouraged, as she simply crawled up my oar, as if it were a pre designed "kitty bridge", and joined me in the boat. 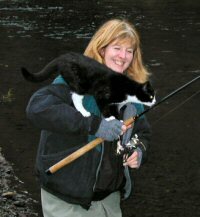 Molly became an avid fishergirl. This catches me up to last night. The fact of the matter is, Molly dislikes it very much if I cross the river and leave her on the home side. She yowls with discontent and stares as the dogs and I cross, with ease. Until last night, I felt safe that she would not follow. However, last night, not wanting to upset her, I stayed on the home side. I waded out six feet from shore, knee deep, and cast a spruce fly into the current. The water was freezing against my bare legs. Awe, dang, Molly! I'm close enough to you! Settle! Molly stood perched precariously on a rock and was surrounded by 6 inch deep and flowing water. All four paws were collected neatly under her, on a five inch stone. She dipped her paw into the water, to test it. I watched for a bit, and told her no. I resumed my fishing. Molly, no! Mom is right here. Settle! I took up the slack in my line, and recast. Looking behind me, I see Molly eyeing the water. Staring out, a couple feet into the current, as if she spotted the next rock to jump to. Molly, there is no rock there! It is a foot deep. Satisfied, I returned to my casting. Kilchis and Dee Dee were chasing dippers on the other side of the river. I turned abruptly to find Molly up to her chest in water! Did she run, flinging her fur in disgust? Did she scramble in feline furor? NO! She just stood in the current, while the water rippled against her fur! What happened next, I'd not believe, unless I was witness to it! To my utter disbelief, Molly launched, and began swimming for the other side! The current, fairly shallow and strong, swept her downstream, towards me. With one hand on my rod, and one dipped towards the water, I scooped her up, and returned her to shore. There, I expected her to shake and tremble and fear. She simply stared at me with dripping wet fur, as if to ask what nerve I had, to stop her feline frolics? I give up. I thought I knew cats. I don't know Molly, anyhow. Molly the dog that looks all to heck like a cat. I couldn't fish anymore. I was laughing too hard, and could barely stand. I headed off to report my adventure to the troops, back home. Would they believe me? Yes. Molly was dripping to the bone! Soon, she dried, just as Kilchis did, and together, they headed up for bed. Sweet dreams of living on the river. I bought a jigsaw puzzle at a garage sale on Saturday. I've really wanted one for the last couple of years as my life has grown more hectic. "Grab a load of wood on your way in." Gladly! We always helped out and brought in plenty! What a contrast to see inside! Neatly hung and delicately painted bible verses that Loretta displayed quaintly on the walls of her kitchen. Jim and Loretta have found peace on the river. 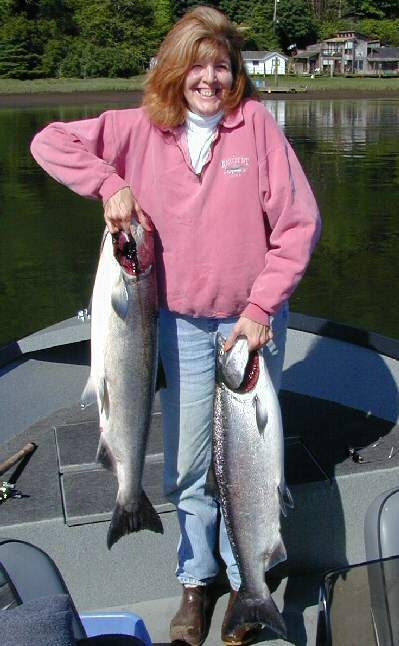 The Erickson's warm country home was especially welcome after steelhead fishing on the Nehalem. We'd come in from an exhausting cold, bleak and wet winter day's fishing. Most every time, we'd all pour a cup of coffee, and join Jim by the fire. Loretta, more often than not, would be putting together a jig saw puzzle on the dining room table. After warming by the fire, (and tiring of the crude fisherman talk), I'd join Loretta at the table and quietly search for pieces that fit to her puzzle. Loretta didn't hear, then. She's since had a miraculous surgery and is learning to hear with some new technology. But until last winter, she studied her puzzle in complete silence. We didn't worry about talking. We just smiled, and began putting together pieces of the puzzle. I now have my very own puzzle, and I am dreaming of wet, winter days when it is cold out. Three pieces to my puzzle are missing in my life's puzzle box. As soon as I find those missing pieces, I will be able to breath easier. I'll light a candle on a wet and windy day, reach up for that box that I bought at the garage sale, open it, and dump the pieces out on the table! I recall a friend of mine back in high school. I was a much different person, then, and had too much time on my hands. My dear friend lived her life at a rapid pace. I'd call her on the phone, and suggest doing something, because I was bored. Her response still echoes in my mind. "Bored? How could you be bored? There are not enough hours in the day!" Oh, the envy I felt, when I heard that! It totally baffled me, and I worked for years to try to find her secret. I have found her secret! However, in so doing, I have lost pieces to my life's puzzle. Idleness, relaxation, and boredom, where are you? You know, it's all in how you look at it, and it's all about the "grass is always greener." I believe, after seeing both sides, I'm ready for the greener grass. As the sun shines down on the Kilchis river meadow and the garden needs watering, I know that today is no day for a puzzle. Besides, the kids are hungry, and I promised blueberry pancakes. I have "ready set" contests to do on the board, shopping at Freddies, and my post office to check. Three phone calls to make to doctor's and the boat to help put away. We went cutthroat fishing this morning, at the crack of dawn! I slid the puzzle up on the top shelf of a frequently used book shelf. It is in plain view. It's stares at me like a brass ring on the merry go round of life. One of these times around, I'm going to grab for it, and I'm going to get it. It's going to happen on a very precious rainy winter day, after fishing for steelhead, when nothing else calls for attention. And now that Loretta can hear my voice, I'm going to call her on that day, and let her know just what an inspiration she has been, calling me to peace! I must not let it sit on the shelf too long, however! You know, the missing pieces to my life may very well be right in that box! Humpty Dumpty didn't even fall! All the doc's nurses and even Doc Hall, couldn't put Jennie together again! It's a darn good thing I haven't fallen! Just got back from the doc and he ordered me to 6 weeks of physical therapy. You know what? I don't have the time! Not going! If I went to every doctor appt. they asked me to, I'd have no life. I'll consider it, but... not right now! :) I have jigsaw puzzles to do, you know! On a more important note: Ifish is now incorporated! I just got my papers, and I'm trying to understand them all! Wow! This is exciting to me!!! I'll even get an official stamp to play with! Jennie is now an executive! What are my duties, you ask? Well, I'm headed out to clean the chicken pen, right now! To start, take a look at Stan's new column. He's talking about those darn secret red and white wobblers again! He doesn't keep any secrets! Before you know it, everyone's going to be catching fish! I feel that keen eyesight is so much more than visual acuity. It is an awareness of your surroundings; thoughtful time, noticing change and detail. By this time, most of you are aware that my visual acuity is very poor. However, I sincerely feel my eyesight is a wonderful gift. No matter how weak it reads on a medical chart, it is incredibly valuable to me, and frankly, I know no comparison to yours. When I was a small child, I remember waking up to a blur, until I reached for my glasses. My one childlike dream and my one wish was to wake up someday, open my eyes, and immediately see clearly. Sometimes, after waking, I'd lay in bed with my eyes squeezed tightly closed, and say a very sincere prayer that I would be healed. After the prayer, I would slowly wedge my eyes open, expecting miracles! I was always met with the same old blurry "sky blue" walls of my bedroom, just the darn same as it had always been. If God was so great, and I was so childlike and innocent, why wouldn't he answer my prayer? Just as in bible stories I had been taught? Later, I learned to appreciate my blurry world. I referred to it as "softer vision." I was able to take off my glasses when things overwhelmed me, and see all of the softer edges of the world. It was comforting, and not many people had the ability to take the sharp, starkness out of their surroundings. As my softer vision became softer and softer, I consulted expert opthamologists for an answer to that prayer. What was supposed to be two surgeries, turned into several exasperating surgeries. What was supposed to be a month long procedure, turned into years of surgeries to fix surgeries! I have varied results in both eyes. One eye that now sees multiples, and one that is dimming. I wrote several pieces in that era, and forgot about them all. I sent them to a friend in Spokane at that time, and it wasn't until last week, that I heard them again. He sent me a CD with over 100 songs that I have written! I was so excited to listen! I am now searching for someone that understands current MIDI, so that I can remix them for today's standards, and maybe even put out a cd! I'm so excited, because I had written a song for each river I have fished. They are all there. They just don't "display" right, now! Regardless of how it might happen differently than yours, my eyes still send messages to my brain, just the way they are supposed to. They just "display" differently, also! ... I was sitting beside my favorite deep pool on the Kilchis river night before last, watching a family of otters play, not 10 feet away. In the dim evening light, I had to struggle to find and focus on them, but it was the closest I had been to their follies. Soon, Bill came down and sat beside me. We sat in silence until they disappeared somewhere. I glanced up into the trees, squinted my eyes hard, and asked Bill, "What are those red berries in that tree?" "Jennie, those aren't berries, those are vine maple leaves, turning color." I drew in a sharp breath. "Oh, Bill! Fall is coming!" Now that he has drawn the image, I too, can see the leaves! I can feel Fall approach! You know, it's funny, but I'm convinced, now, that God had answered my prayers in ways that I could not understand, or "see" before. Vision is so much more than what reads on a medical chart. There is a chance that someday, I may be considered blind. That used to be a sad thought for me, and it still scares me a bit. But, on the flip side, I just wonder and become a bit excited to think how much more I might "see" in a yet softer world? I'll leave you with one more song I wrote in the early 90's. I didn't live on the Kilchis, at that time. As I listen on this Saturday morning, I cannot believe how it tells the story of how I feel this very Saturday Morning, living along the banks of the Kilchis river.